Improve Posture - Tips for Perfect Posture! Posture Perfect – Tips on How to Improve Posture! 1. 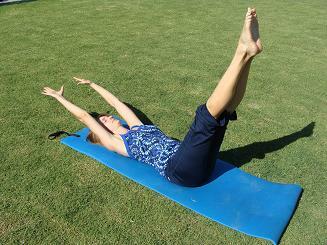 Strengthen your abdominal muscles through Pilates-based exercises. Having strong abdominal muscles supports your spine and allows you to stand up taller and with less pain. Pilates exercises are well-known to realign the spine by correcting the length-tension imbalances in the muscles supporting the spine, pelvis, and shoulders. 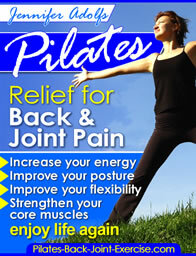 Thus, it assists the whole body in working more efficiently and with a stable, solid core that will improve posture. shoulders over your hips, and abdominal muscles drawn in with a slight curve in the lower back. 3. Stretch the tight muscles, such as your hamstrings, which pull on the back muscles causing pain resulting in a slouched posture. Check out this article to find out how and what to stretch for better posture. 4. When sitting pull your bottom right up against the back of the chair. Then stack the rest of the spine straight up so that your shoulders are right over the hips, ears over the shoulders, and your chin parallel to the floor. 5. Work on exercises that strengthen the upper and middle back muscles. Lateral rowing exercises shown here with the stretch band, as well as Pilates-based mat exercises, including the elbow lift lying on your stomach are just a couple to start with. How many people do you know that would like to improve their posture? When you do see someone with good posture don’t they look taller, thinner, and younger than they might be? Wouldn’t you like to improve yours too? Good posture helps your body function at its best; you breathe better, move more efficiently, have more endurance, and just look better. Most of us feel tension and pain in our shoulders and upper back; this is often due to incorrect posture either while sitting or standing. Learning the causes of bad posture and how it affects the tension in other areas of the body is the first step in correcting and alleviating bad habits. Next, you’ll need to know how to stand up straighter so you can move more confidently and with less pain and strain on the body. Did you know some of these facts about posture? · Proper posture can help prevent many aches and pains including chronic back pain. · Wearing high heels regularly can lead to bad posture habits and back pain. · Being overweight can cause bad posture by pulling on the back and weakening abdominal muscles. · Stretching regularly can help you stand up straighter. · When having to stand for long periods of time keep your abdominal muscles drawn in and hands at your side to ward off back pain. · When you lift things with a straight back it helps to reduce injury risk. Keep the object close to you with your chest lifted, back straight, abdominal muscles drawn in, and then use the strength in your legs to lift the object not your back. · Good posture goes hand in hand with better balance. · Doing posture exercises that strengthen and pull on the muscles of the spine, such as Pilates can help you improve posture and increase your bone density. One of my favorite ways to get my clients to stand taller and improve posture is focusing on the "Domes". Pilates Domes or areas of uplift in the body help us to gain more space where we need it. and the last is at the base of the skull feeling a reach up out of the back top of your head! Yeah! You just gained a half inch, maybe more! Leave Tips to Improve Posture and help improve yours today with exercises in the new Pilates Ebook!